The grasslands of Tibet in the summer are amazing. They are bright green with many wildflowers mixed in with mountains in the distance. Many nomads are actually only semi-nomadic. Many live in a mud-brick home during the winter months and then live in tents from late spring through early fall. 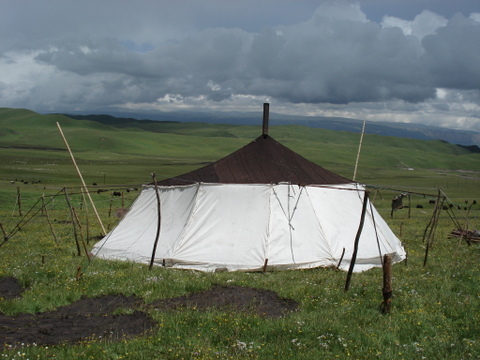 Nomad tents can often be found across the sprawling grasslands of Tibet. The above picture was taken near the Ganjia grasslands located between Rebkong and Labrang in eastern Amdo (near the Qinghai-Gansu province border). Camping with Tibetans on the grasslands of Amdo can give you an up close look at nomadic Tibetan life that is quickly disappearing. You can help milk the yaks in the morning and then lead them up the mountains to graze (under the watchful eye of a local nomad of course). You can learn how meals are cooked over a yak dung fire and explore the vast grasslands by doing day hikes in the area. Most importantly, you can experience Tibetan hospitality which is second to none. The regions where nomadic camping is arranged are authentic Tibetan areas. They are not "special camps" that are set up for tourists like the one's found in some places in Mongolia. Living conditions are difficult with very few modern conveniences. Even without these things, your time will be a lot of fun and one that you will remember for a lifetime. Living among Tibetan nomads is something that few foreigners are able to experience. I am very sorry but this isn't a type of camping! This is a way of life- these people travel with their stock all over the country from one green spot to another, and it is an incredible life style! Wow. That is so beautiful. I already live in a small village in the Welsh mountains so enjoy the wilderness, but that looks so remote it is woderful. This is a terrific site! It has been very informative and useful to me. I have found several useful products. Just wanted to let you know how much I enjoy your website. I find it really useful. Thank you so much for all the info. I received from your sites! That's an interesting type of camping indeed, thanks for sharing. If you intend to go camping make an extensive list if item you will need at least 2 weeks before the trip. Then 2 days befroe the trip narrow it down to the absolute essentials.